License! report that Pocket Books have renewed their license to produce Star Trek novels. So you know, that's good! Thanks to Therin of Andor for pointing it out on the TrekBBS. Meanwhile in Germany it's not so good news, as my German correspondence Jens Deffner (of Unreality SF) has reported, Cross Cult (publisher of German translations of Star Trek books) have announced that they have put their series of Star Trek Enterprise translations on hold, due to poor sales. 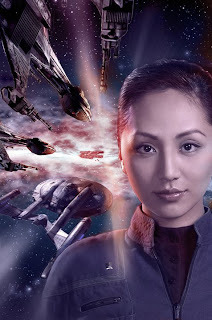 Already released are Last Full Measure (Das Höchste Maß an Hingabe) and The Good That Men Do (Was Menschen Gutes tun), but Kobayashi Maru, which had new cover art released for over a year ago, will not see publication.